Today, the York Catholic girls played their seventh state championship game in the past eight seasons. Today, they lost 45-38 to Bishop Canevin. But — they lost with grace. © 2013 by The York Daily Record/Sunday News. (Left to right) York Catholic’s Zaenna Echevarria, Morgan Klunk, Hannah Laslo and Amelia York listen to head coach Kevin Bankos in their locker room after losing 45-38 to Bishop Canevin in the PIAA Class AA girls basketball championship game on Friday, March 22, 2013, at the Giant Center. © 2013 by The York Daily Record/Sunday News. 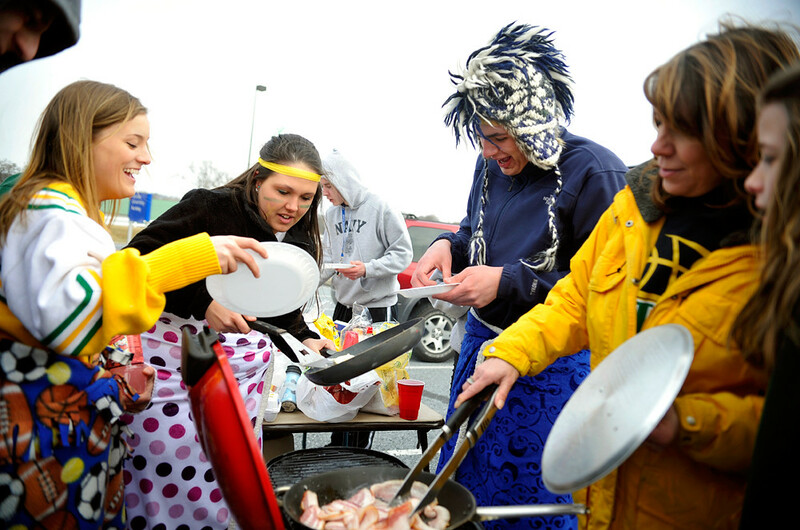 (Left to right) York Catholic seniors DeeDee Davis and Bri Raineri and junior Ian Shelley help themselves to eggs as Mary Williams and her daughter Christina, 11, work on cooking the bacon at a student tailgate outside the Giant Center before attending York Catholic’s PIAA Class AA girls basketball championship game on Friday, March 22, 2013. © 2013 by The York Daily Record/Sunday News. 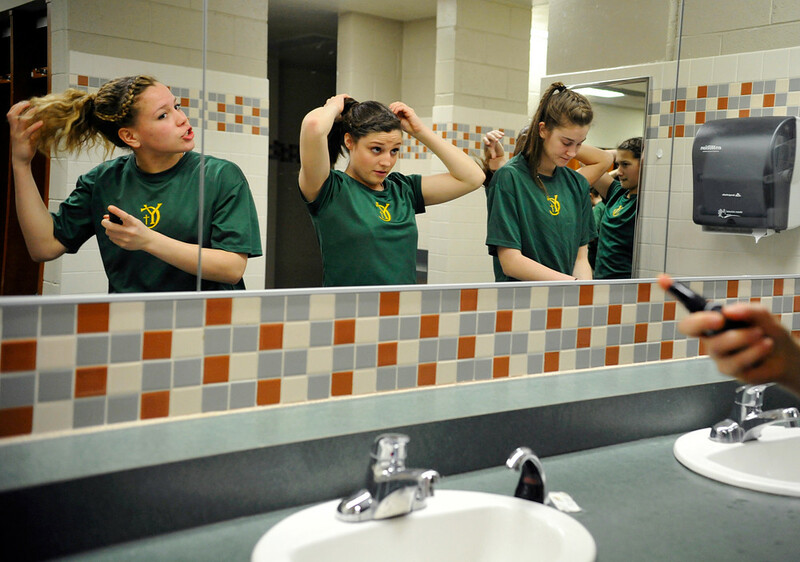 (Left to right) York Catholic’s Zaenna Echevarria and Deanna Chesko fix up their hair as Morgan Klunk washes her hands in their Giant Center locker room on Friday, March 22, 2013, before playing the PIAA Class AA girls basketball championship game. © 2013 by The York Daily Record/Sunday News. 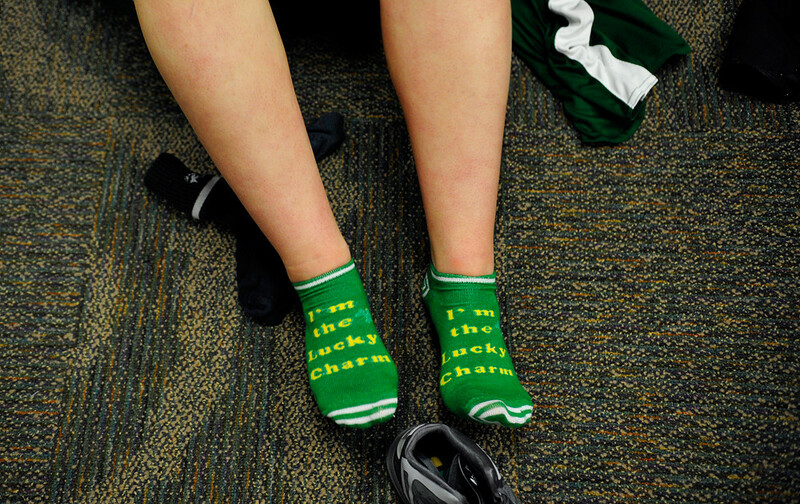 York Catholic’s Amelia York prepares to change out of a lucky pair of socks in the locker room at the Giant Center on Friday, March 22, 2013. © 2013 by The York Daily Record/Sunday News. 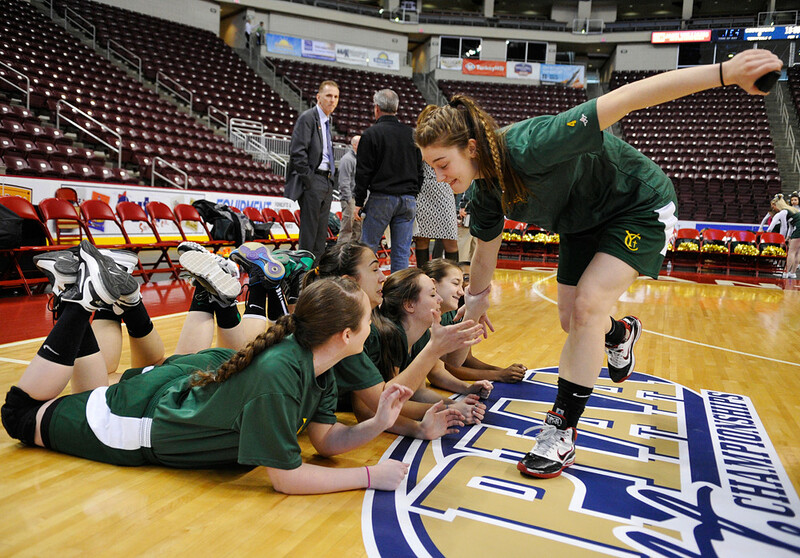 York Catholic’s Morgan Klunk swoops in for high fives from her teammates as they get ready for a group picture on the Giant Center’s court on Friday, March 22, 2013, before the PIAA Class AA girls basketball championship game. © 2013 by The York Daily Record/Sunday News. 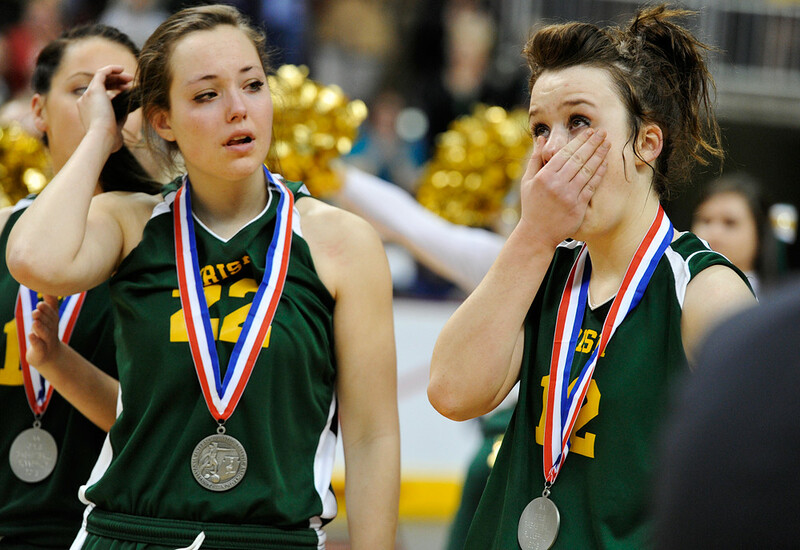 York Catholic’s Amelia York, right, wipes her face after receiving her PIAA Class AA runner-up medal on Friday, March 22, 2013, at the Giant Center. To her left is Marissa Ressler (22). © 2013 by The York Daily Record/Sunday News. 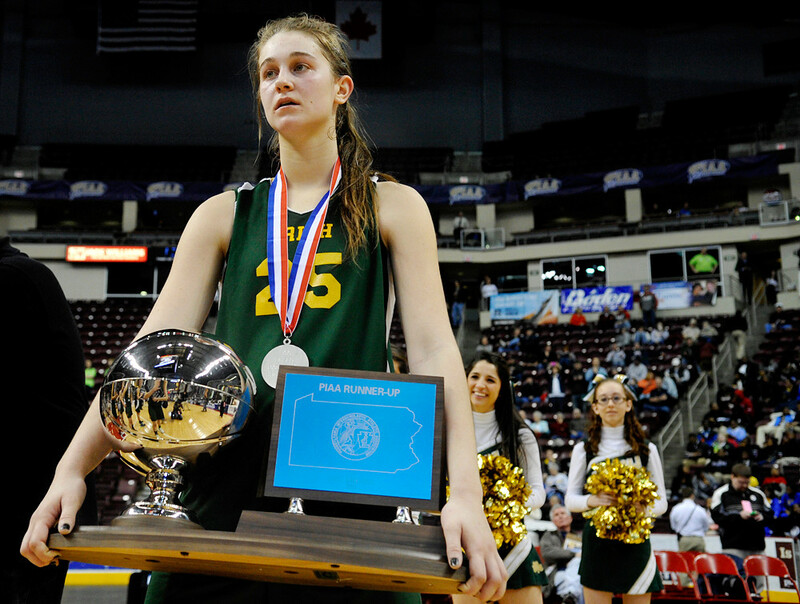 York Catholic’s Morgan Klunk holds the PIAA Class AA runner-up trophy while watching Bishop Cavenin players receive their championship trophy on Friday, March 22, 2013, at the Giant Center. © 2013 by The York Daily Record/Sunday News. 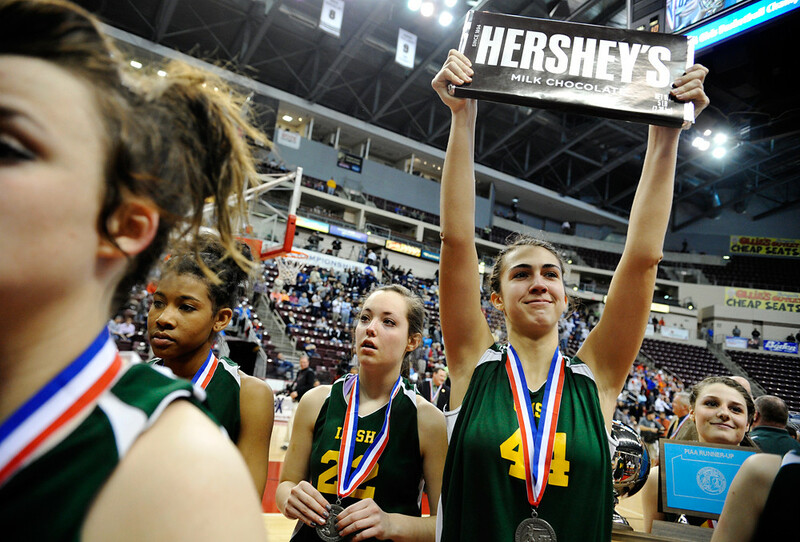 York Catholic’s Hannah Laslo holds up a five-pound Hershey’s chocolate bar as she and her teammates greet the student section after losing 45-38 to Bishop Canevin in the PIAA Class AA girls basketball championship game on Friday, March 22, 2013, at the Giant Center. © 2013 by The York Daily Record/Sunday News. 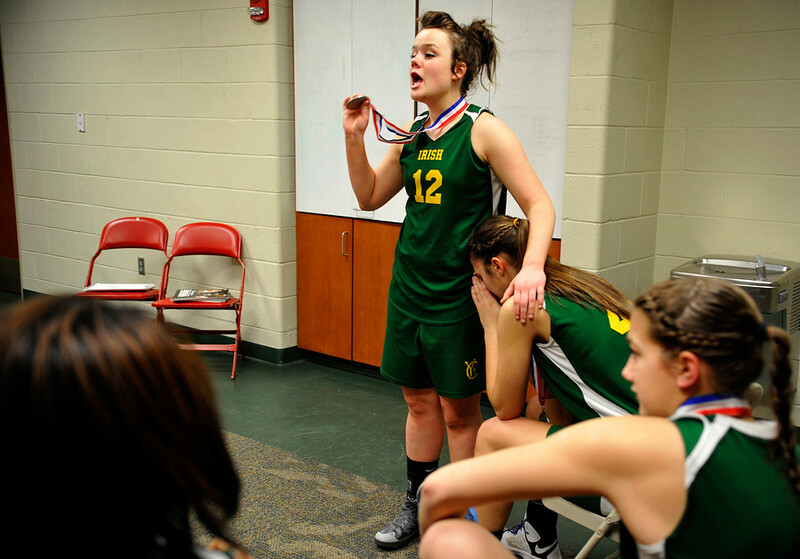 While comforting teammate Hannah Laslo, York Catholic’s Amelia York gives a pep talk to her fellow players after York Catholic lost 45-38 to Bishop Canevin in the PIAA Class AA girls basketball championship game on Friday, March 22, 2013, at the Giant Center. I’d like to thank the girls for letting me follow them around, even inside the locker room, and being completely normal about it. They’re a class act, a strong team and wonderful people. I’ve never taken the time to count how many times I’ve been assigned to photograph people as they work out or otherwise exercise. But even if we don’t include sports practices and games, it’s still a fairly large number. In the week around New Year’s this year, I happened to have two separate assignments that had me cover people going through their routine gym workouts. I assured them that I was not suffering in these assignments. On the contrary, I see these assignments as a challenge to show the human interacting with and mimicking the form of the gym equipment. © 2013 by The York Daily Record/Sunday News. 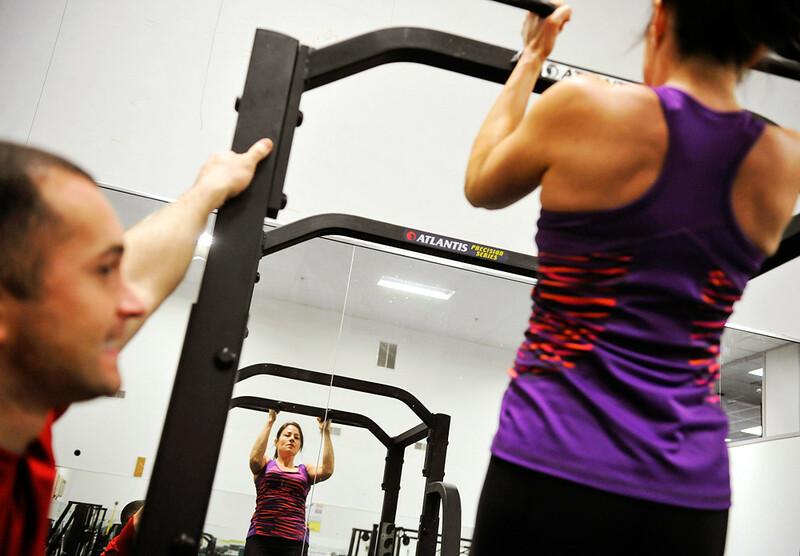 Shelby Dietz, 40 of Windsor Township, completes a set of pull-ups under the supervision of her personal trainer Evan Branin on Wednesday, Jan. 2, 2012, at Strictly Fitness in Springettsbury Township. Dietz has been working out with personal trainer Evan Branin for about five years, and has been concentrating on weights and strength training. Dietz said she typically does four days of strength training and two days of running in a week. © 2012 by The York Daily Record/Sunday News. Mary and Craig Duttera of Dover Township exercise their arm muscles in the fitness room at Bob Hoffman YMCA on Thursday, Dec. 27, 2012. 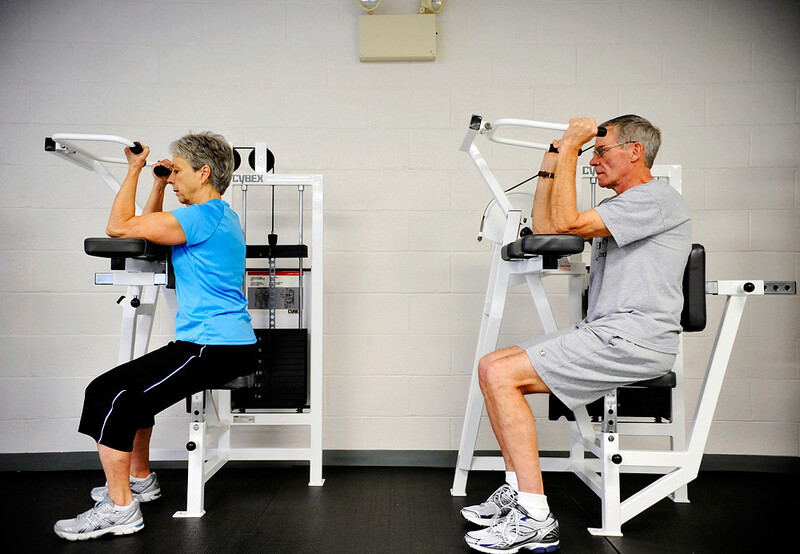 The couple have been members at that YMCA for about 20 years, and work out 5-6 times a week. Since Mary joined Craig in retirement several years ago, they have been working out together more frequently. My first-ever cheerleading assignment took me to the YAIAA Cheerleading Championship, where seven teams competed in two divisions. It was a lot of fun, especially with the presence of the youth cheerleaders who performed showcase, non-competition routines. If I shoot this next year, I’ll definitely take my shooting to the next level, but nevertheless — this was fun. © 2013 by The York Daily Record/Sunday News. Dallastown Cougar youth cheerleader Nautica Shortlidge, 11, works on 11-year-old teammate Lauren Maher’s hair as Riley Sharp, 10, looks on before they showcased in the 2013 YAIAA Cheerleading Championship on Saturday, March 16, 2013, at Dallastown Area Senior High School. William Penn took first place in the “small” division of the 2013 YAIAA Cheerleading Championship on Saturday, March 16, 2013, at Dallastown Area Senior High School, while Central York won in the “large” division. © 2013 by The York Daily Record/Sunday News. Members of a Dallastown Cougars youth cheerleading squad practice their routine in the wrestling room before showcasing in the 2013 YAIAA Cheerleading Championship on Saturday, March 16, 2013, at Dallastown Area Senior High School. © 2013 by The York Daily Record/Sunday News. Susquehannock cheerleaders return to the locker room after performing their routine in the YAIAA Cheerleading Championship on Saturday, March 16, 2013, at Dallastown Area Senior High School. © 2013 by The York Daily Record/Sunday News. 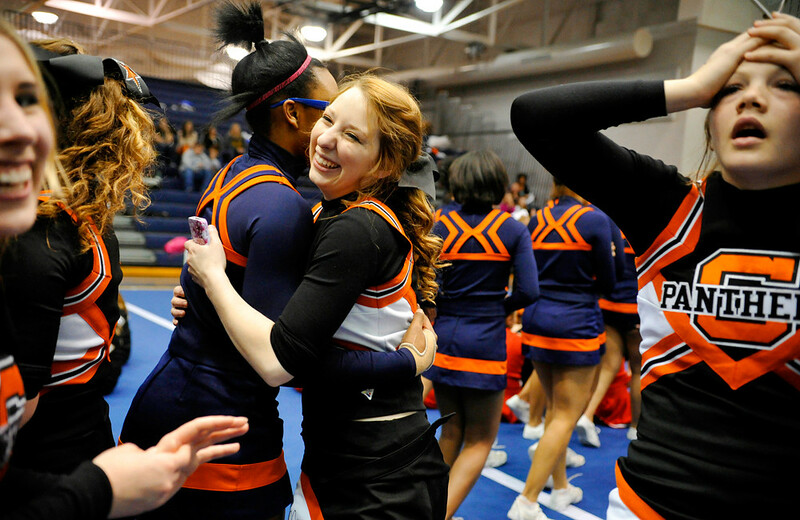 William Penn cheerleader Shalai Tyler and Central York cheerleader Abbie Davis, center, hug on the mat after each school took first place in its respective division in the 2013 YAIAA Cheerleading Championship on Saturday, March 16, 2013, at Dallastown Area Senior High School. 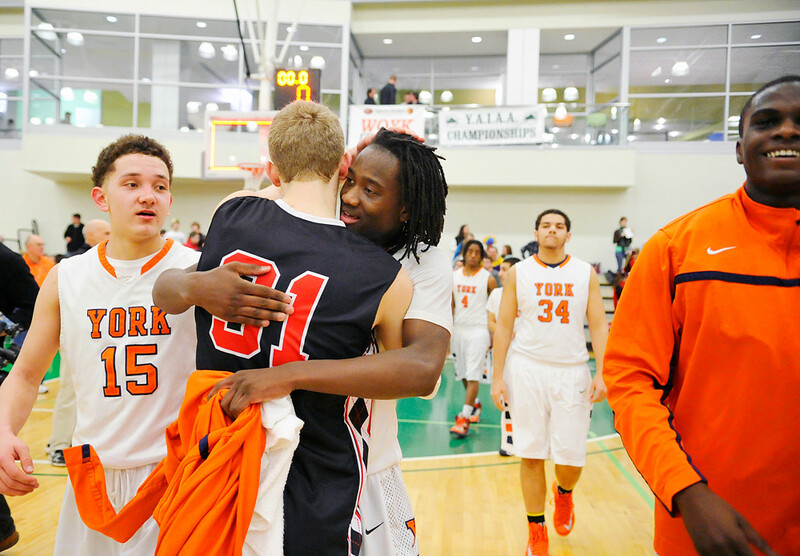 Check out more photos, plus a video I produced of Central York’s winning routine. I love shooting basketball. It was the first sport I ever shot (thanks for throwing me in, Rae) and much of my first winter in York was spent covering high school games. This season, not so much, oddly enough. But here’s a collection of some reaction-oriented feature pictures — or jubilation, or “jube” — from the post-season. © 2013 by The York Daily Record/Sunday News. 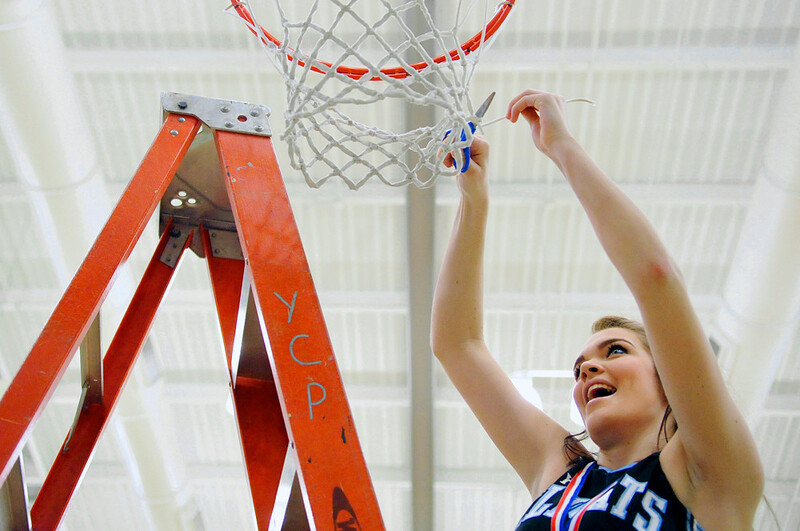 Dallastown’s Katie McGowan cuts off a piece of the net after the Wildcats won the YAIAA girls title game on Thursday, Feb. 14, 2013. Dallastown defeated West York 50-37. © 2013 by The York Daily Record/Sunday News. William Penn’s Trey Shifflett, left, looks on as Stephen Dickson gives South Western’s Mike Duffy a hug after the Bearcats defeated the Mustangs 57-44 for the YAIAA boys title game on Friday, Feb. 15, 2013, at York College. © 2013 by The York Daily Record/Sunday News. 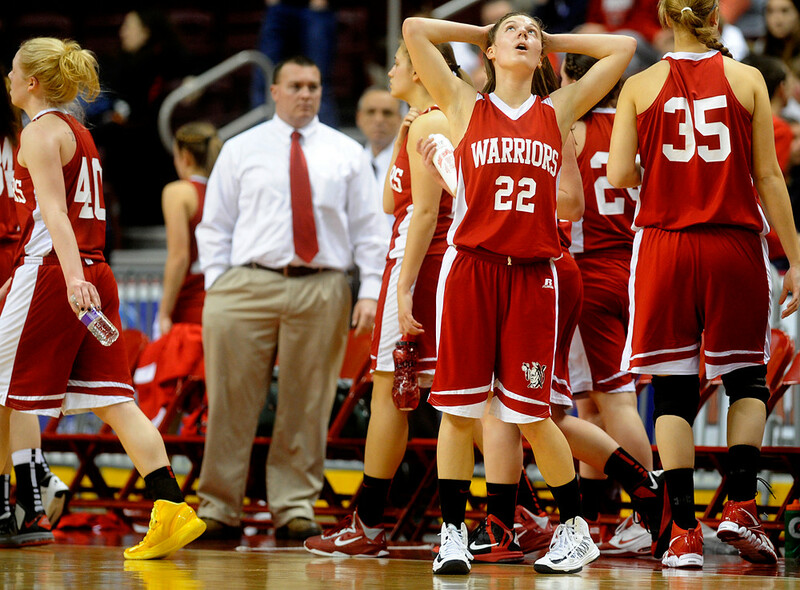 Susquehannock’s Makenzie Fancher looks at the scoreboard after the first half of the District 3 AAA girls basketball title game on Saturday, March 2, 2013, at the Giant Center. Palmyra defeated Susquehannock 46-30 to capture the District 3 AAA girls basketball title. © 2013 by The York Daily Record/Sunday News. 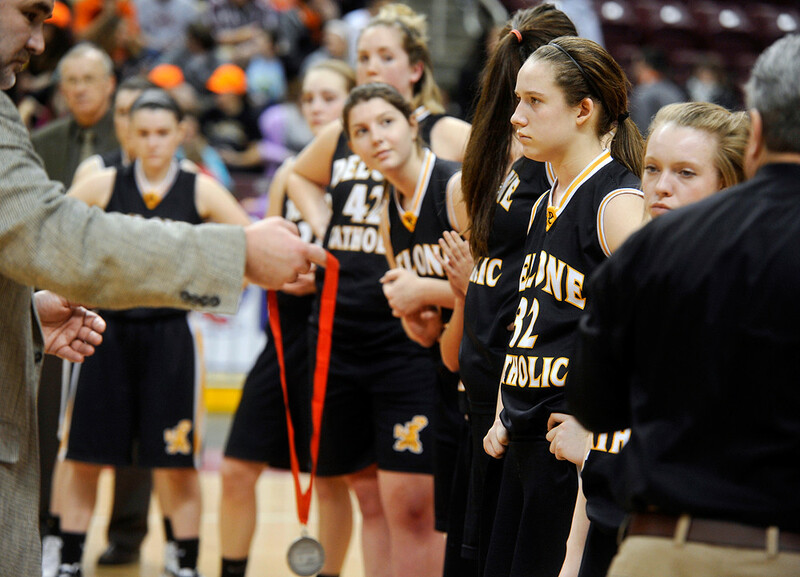 Delone Catholic’s Allyson Shipley, 32, stares straight ahead during the runner-up medal ceremony after York Catholic girls defeated Delone Catholic 56-38 to win a District 3 record eighth Class AA basketball championship on Thursday, Feb. 28, 2013, at the Giant Center. © 2013 by The York Daily Record/Sunday News. William Penn cheerleader Shalai Tyler comforts player Derek Wilson as he gets up from the bench to congratulate Harrisburg after the Cougars defeated the Bearcats 78-76 in overtime to capture the District 3 AAAA boys basketball title on Saturday, March 2, 2013, at the Giant Center. © 2013 by The York Daily Record/Sunday News. 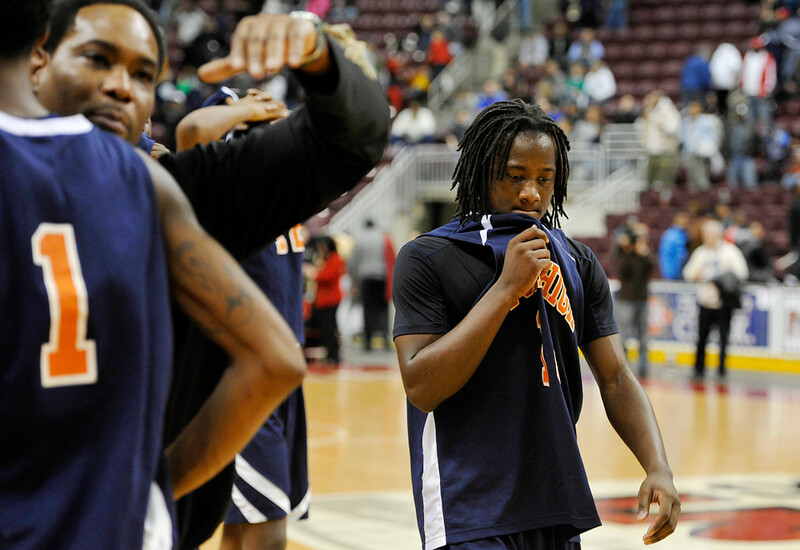 William Penn’s Stephen Dickson leaves the court after congratulating Harrisburg after the Cougars defeated the Bearcats 78-76 in overtime to capture the District 3 AAAA boys basketball title on Saturday, March 2, 2013, at the Giant Center. © 2013 by The York Daily Record/Sunday News. 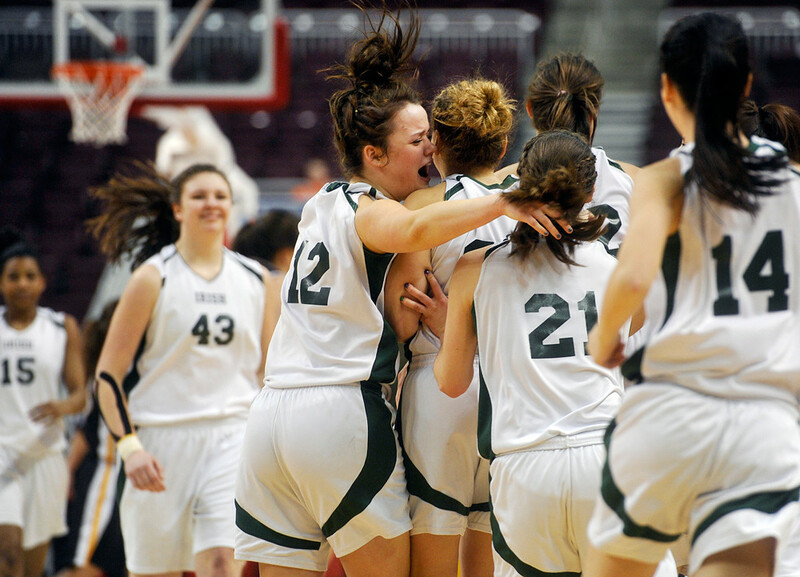 York Catholic’s Amelia York, 12, hugs her fellow starters as they greet the relief players on the court after defeating Delone Catholic 56-38 to win a District 3 record eighth Class AA basketball championship on Thursday, Feb. 28, 2013, at the Giant Center. For me at least, it’s easy to forget, after covering some of these girls for three seasons, that they’re just girls. They’re still in high school. They’re just kids. Then you get off the court, and they’re jumping and whooping and giving each other piggy-back rides back to the locker room, where they then break out into song and run around and remind you that they’re still girls, and that’s totally okay. © 2013 by The York Daily Record/Sunday News. 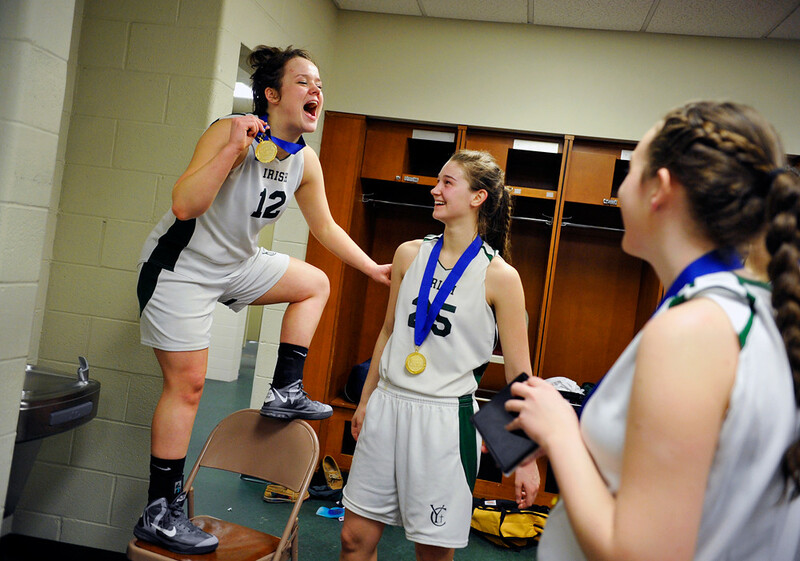 Standing on a chair, York Catholic’s Amelia York leans on teammate Morgan Klunk while pretending to be a character from the Disney movie “Mulan” in the team’s locker room after defeating Delone Catholic 56-38 to win a District 3 record eighth Class AA basketball championship on Thursday, Feb. 28, 2013, at the Giant Center. © 2013 by The York Daily Record/Sunday News. 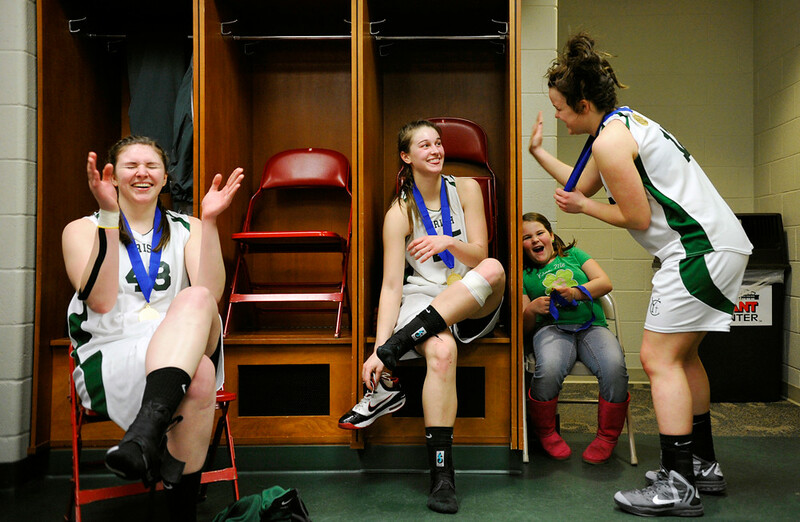 York Catholic players Emma Keffer, Morgan Klunk and Amelia York celebrate in the locker room, alongside their assistant coach’s daughter Amanda Reed, 6, after defeating Delone Catholic 56-38 to win a District 3 record eighth Class AA basketball championship on Thursday, Feb. 28, 2013, at the Giant Center.